Augie Visocchi of the Detroit-based rock band The Hard Lessons is a big fan of bocce. That in part explains why, when the band comes to Brooklyn for a three-day residency April 27, 30 and May 1, they'll do so at Park Slope's Union Hall, known as much for its bocce ball courts as its strong offering of indie rock bands each week (read more about the residency after the jump). Leaving anywhere out? Let us know in the comments section. When Augie Visocchi and Korin Louise Visocchi are not on stage at Union Hall as the rock band The Hard Lessons, they can be found on the venue’s bocce ball courts. 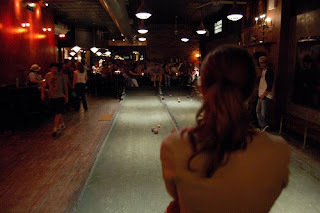 When the band was looking to play a few nights in New York, they immediately thought of Union Hall, and not just for the lure of the bocce ball courts. On April 27, 30 and May 1, the band will hold a residency there here in Brooklyn, one of the few places the band can imagine living besides their home base of Detroit. “Every once in a while when we fantasize about moving somewhere, we’ll think about Brooklyn,” said Augie. For now, the band – whose members are also recently married – find themselves content to be living in what they call the “Arms Forest.” What’s the Arms Forest? You may be living in it right now. One night, late at night, in Detroit about a year ago, Augie and some friends found themselves at an abandoned building called “Forest Arms,” which, at 4 a.m., looking up at the wrought iron of the entrance, he misread as “Arms Forest.” The dyslexic moment, in the end, was a revelation. Formed in 2003, the band was informed much by the garage scene happening around them in Detroit, resulting in a raw rock sound. In the years since, they’ve tried to move from that defining sound and evolve. The resulting album is a distillation of that process, a rock and roll record that incorporates all of those new influences. Live, the duo’s joined by a drummer for a three-piece that wows audiences with its full sound despite the lack of a full band – all thanks to the musicians’ multitasking. 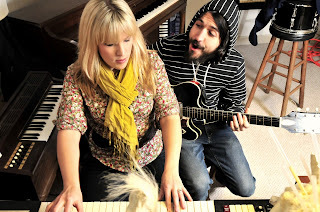 Specifically, Augie has his hands on the guitar, his feet on effects pedals, and sings, while Korin has one hand on her micro keyboard to produce a bass, another on her keyboard, set up for synth and organ sounds, and is the lead vocalist. “It’s definitely rewarding when people come up to us and say they can’t believe that amount of sound came out of three people,” says Augie. Brooklynites don’t have to blow off one or two nights of the band’s three-day residency, as for each set the band will be mixing it up a bit, doing some more rocking acts and pulling together the slower numbers for another for a slightly more acoustic set. Audiences may also get early copies of “Arms Forest” on vinyl and CD, not officially out until May 27. Catch The Hard Lessons on the bocce ball courts and on stage at Union Hall on April 27 an April 29 at 7:30 p.m. and May 1 at 10 p.m. Tickets are $10.